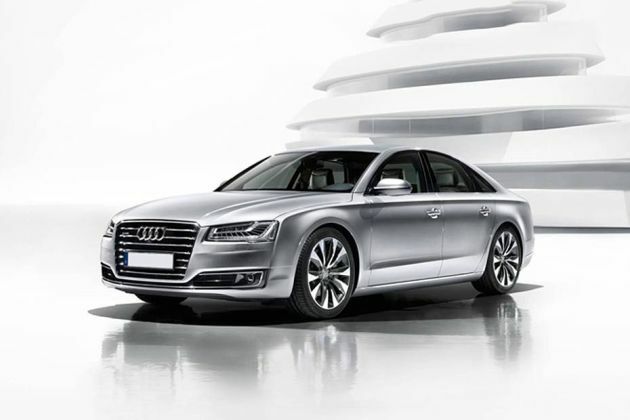 Audi India has recently released another variant in its flagship A8 Saloon line-up. It is an armored car that comes packed with high-grade safety features unlike any other. It has been introduced at the Auto Expo 2016 in Delhi, where it caught the attention of luxury car enthusiasts. Targeted for section of VVIP customers, this new release is up against the likes of Mercedes-Benz S Guard. Let's explore further details of the car. 1. It is the one of the most secured luxury saloon in the auto industry. 2. Its W12 cylinder engine delivers monstrous performance. 1. Price tag of this armored sedan is extremely high. 2. Waiting period is way too long. 1. This latest armored car gets VR 9 ballistic standard protection that safeguards passengers from explosives and fire arms. 2. This new variant is packed-in with all the amenities that redefine the standard of high end luxury saloon. Audi India has hit the headlights again by introducing the armored version of A8 saloon in the country. The event took place at the 2016 Delhi Auto Expo, which happened earlier this month. As per the company's claims, this new product is the most secure Audi ever built. It promises advanced security and protection to the occupants inside with its armored suit. This bullet-proof machine is powered by a 6-litre W12 engine, whose transmission duties are handled by an Automatic 8 speed gearbox. Not only with regards to the security, but the interiors of this saloon too are of top class with affluent features. With elegant cabin and high-end amenities, this latest release redefines its class. This latest variant in the A8 lineup looks beautiful as usual. It inherits the design language of Audi and exudes the sense of extravagance from every corner. The front fascia of this powerful saloon has an aggressive look and sleek headlamps add to the overall beauty. This light cluster gets Matrix LED lights that dazzle the front facade. The front grille drapes across the bottom of the front mask and the company's emblem in all its glory resides over the grille. Below this one can see thin air dam which perfectly compliments the glory of the face. The creases over the sides of the motor are intricately designed and are gorgeous. The rear section of this saloon looks stunning, thanks to the signature lighting design and body structure. The rear light cluster houses signature LED brake lights that adds to the grace. The twin rectangular exhaust pipes emphasize the rear design. Overall, this A8 L is far more gracious and opulent unlike any other Audi in its class. The interiors of this car are made to offer penultimate luxury with specialized seating arrangement. Step inside the cockpit, and you will feel the harmony and artistry of the cabin. At front the dashboard that spread along the cabin length protrudes towards the glove-box compartment. The AC vents are placed symmetrically on the dash and the piano black inserted on the dash adorns the overall look and feel of the cabin. The 7 inch touch screen display interfaces most of the infotainment system incorporated inside the car. From parking, camera reversing and multimedia, this touch screen navigation will take your ride experience to next level. The leather steering gets wooden inserts, which brings it a lavish aura. The steering wheel is further mounted with gear shift paddles and audio control switches, which will make your drive hassle-free. Behind this steering rim is an advanced instrument panel that features a tachometer and speedometer that are perfectly aligned to the driver's vision. You can find that the cabin gets an extensive use of leather that brings a vibrant aura to the insides. Door sills are decorated with aluminum inserts that brighten the ambiance. The seating comes with an ergonomic arrangement is comfortable with ample leg-room and thigh support. Beside this, the seats have an electrical adjustment and massage facility. This latest variant in the A8 line-up is powered by a 6.0 litre W12 engine that comes with direct injection system. Its transmission duties are handled by an 8 speed automatic transmission. This six cylinder power plant boasts a displacement capacity of 6299cc. It has the ability to generate a maximum power of 493.5bhp at 6200 rpm and delivers a maximum torque of 625Nm at 4750rpm. It is capable of reaching 100 kmph mark from a standstill in mere 7.1 seconds. Also, its top speed clocks at 210 kmph (electronically regulated). This high end saloon from Audi is the safest vehicle ever designed by the German auto major. This version of A8 comes integrated with highly resilient special aluminum alloys, aramide fabric and a hot formed steel armor that offers highest level of protection. This luxury saloon comes with top safety standards that meet the VR 9 ballistic norms. Manufactured at a top-secret facility, this vehicle is built under the company's own supervision. The saloon also comes with a few standard safety features including a communication box in the boot, an intercom, an emergency escape system and fire extinguishing system. On a whole this new armored vehicle is loaded with tons of safety features and is certainly the safest vehicle available for private purchase. Priced around 9.9 crores, this car is also the most expensive in its class. The competitor, Mercedes-Benz S Guard is too loaded with top grade safety features, but comes with a very competitive price tag. Comfort and convenience inside the car is remarkable. Other than the price tag, the car gives everything that one needs.